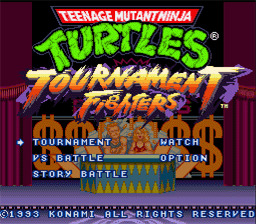 Play Teenage Mutant Ninja Turtles: Tournament Fighters Now! Shredder has been defeated, but there's a new group in town, calling themselves the Shredder Elite! Headed by someone called Karai, they vow to avenge the Shredder, and have kidnapped April and Splinter to lure the Turtles into a contest for control of the city. Interestingly, each version of TMNT: Tournament Fighters has a different story and different characters. This edition features Cyber Shredder, Aska, War, Armaggon, Wingnut, Chrome Dome, the Rat King, and Karai, each with their own unique moves and playing style.